While the majority of the top players are off in London taking part in the Olympic Games, the tour continues to roll on with one tournament this week – The Citi Open. The Citi Open is a joint tournament based in Washington D.C., formerly known as the Legg Mason Tennis Classic on the Men’s side while the Women’s tournament is only in it’s second year. While not at the usual standard of a 500 points tournament, there is still a fairly strong field on the men’s side. Mardy Fish, who chose not to play in the Olympics, leads the field while fallouts with their tennis federations meant Alexandr Dolgopolov and Kevin Anderson meant that neither man was available for the Olympics. The French and Germans are also represented well here, with Jeremy Chardy and Tommy Haas the best chances of a title here for the respective nations. Favourite – Seeing as he withdrew from the Olympics in order to concentrate on defending points he picked up in the 2011 hard court swing, it is very likely that Mardy Fish will have his mind fully focused on the tournament here. He missed out last year here due to injury, but had he played he would have been expected to make the third final in three weeks due to the form he was in. There is no doubting his hard court credentials and he had an impressive 29-11 record last year. The only thing to look out for is the potential ankle injury he may have, which forced his retirement against Gilles Muller and stopped him from defending his Atlanta title. Outsider – No.4 seed Tommy Haas has continued his great run of form by making the Hamburg final a few weeks back, where he was defeated by Juan Monaco in straight sets. The 34 year old has continued to amaze by competing so well at this level since his return from injury over a year ago. The disappointment of missing out on the Olympics (German Olympic Committee refused to support him, a decision made to look even sillier with Philipp Kohlschreiber’s late withdrawal) will serve as top motivation to do well here. Before his injury, the majority of Haas’s titles were during the US Hard Court seasons so it is obvious that he still favours this type of surface. One To Watch – Wildcard Ricardas Berankis is another player who has returned to form (though not quite to the extent of Haas above) after a sizable amount of time out with injury. The Lithuania dropped just one set on his run to the Final in Los Angeles (1st qualifying round, 5-7 to Dennis Lajola), looking impressive in victories against the likes of Nicolas Mahut and Marinko Matosevic. He did not face a break point in his match against the latter and looked utterly dominant on serve for most of the week. While he was embarrassed in the final by Sam Querrey, only picking up two games, it had been a great week for him and much better than what he would have expected. Berankis favoured surface is the hard court and he had also made the final of a Challenger in Winnetka at the start of this month. Only four players have won a singles title in the draw this year, Sam Querrey, Pablo Andujar, Tommy Haas and Kevin Anderson. Of the 12 finalists in Washington last year (8x doubles, 4x singles), only losing Women’s doubles finalists Olga Govortsova and Alla Kudryavtseva will be attending this year. While the tournament is weakened slightly, the Women’s side of the Citi Open does not suffer as much due to the lower tournament level. Many of the seeds would have qualified for the Olympics if not due to competitor limits while Chanelle Scheepers (much like Kevin Anderson in the Men’s tournament) did not enter due to her disagreements with the South African tennis authorities. Favourite – Anastasia Pavlyuchenkova of Russia is the No.1 seed here and suffers from being from a strong tennis country in that she fails to make the tournament despite being in the top 30 currently. After a 25-13 record (w/ Monterrey title) on the hard courts last year, Pavlyuchenkova has struggled to build on that only going 2-7 so far this year. She will be hoping for better in the run up to the US Open, where she made the quarter finals and was defeated by Serena Williams. In the past year Pavyluchenkova has had issues with her service motion and this could be her downfall. Another issue is that many of her recent defeats have been in matches she should be expected to win and that perhaps she does not deal well with the tag of “favourite”. Outsider – The highly rated Sloane Stephens is yet to win a tournament in her WTA career, but for someone of her talent it cannot be much longer. Sloane is only one of a few teenagers around the top 60 at present, where a lot of that can be put down to her appearances in slams. Stephens impressed at Wimbledon and Roland Garros, being defeated by Sabine Lisicki and Samantha Stosur respectively but had great chances in both. While there are no complaints with her performances in the bigger tournaments, defeats like those she has suffered since Wimbledon are incredibly disappointing – losing from 6-1 4-1 up against Melanie Oudin and losing in three sets to Heather Watson. If she can convert her form in slams to the International tournaments there is no reason why she cannot go deep here. One To Watch – As a relative unknown at Wimbledon Camila Giorgi impressed the tennis world with a handy run defeating both Flavia Pennetta and Nadia Petrova (2011 Citi Open champion). The Italian has an aggressive style of play and when on form is hard to deal with. Much like many other young stars, inconsistency is a big issue. Great results like those at Wimbledon are combined with disappointing defeats in matches she is highly favoured to win. There is no doubting her talent though, and if she can get it together there is definitely potential to spring a shock or two. None of the seeds have a Singles title this year, though unseeded players Melanie Oudin and Bojana Jovanovski do. Could Christina McHale be the new queen of American tennis? The in-form 19-year-old has backed up her win against world number one Caroline Wozniacki in Cincinnati with a straight sets victory over Marion Bartoli at the US Open. If it’s not her then perhaps her fellow teens Coco Vandeweghe or Sloane Stephens could take the mantle from Serena Williams. At the age of 31 and after pulling out of the US Open second round with illness there doesn’t seem many more opportunities for her sister Venus to help keep America’s head above water. The pair are mostly looking towards the Olympic Games next year as their main challenge, as indicated by their scheduled Fed Cup participation, and so the younger players have got until then to step up. So far they’re doing better than expected. Vandeweghe won a Grand Slam match for the first time in her career at the age of 19 while Stephens has already achieved a maiden victory at a major aged 18. There was also good news for wildcard junior Madison Keys as the 16-year-old made it to the second round on debut before suffering defeat to Lucie Safarova despite winning the first set against the 27th seed. Add that to Irina Falconi’s third round run, Vania King’s progress and Lauren Davis also coming through, the USA has hope again. Be wary though. Melanie Oudin, a quarter-finalist at the US Open in 2009, crashed out of the first round this year to compound a miserable 2011 which has seen her ranking drop well outside the top 100. At least this time around there is strength in numbers and with a top 20 containing a lot of players in their mid-20s there’s every chance at least one of these youngsters could crack it at the top. While several women progressed in the competition, for 19-year-old Ryan Harrison it proved too much of a task to overcome Marin Cilic as he showed signs of promise but ultimately lost out due to a wavering mentality. Jack Sock has emerged as a promising new face though after beating former top 50 player Marc Gicquel and faces what could be a changing of the guard match with the declining Andy Roddick in the second round. The 18-year-old Sock won the junior event in New York last year which earned him his wildcard to this year’s men’s singles and with Bjorn Fratengelo a junior winner at the French Open this year, there’s hope for the future in both categories. Elsewhere things are looking up for British tennis too. Heather Watson may have been beaten by former champion Maria Sharapova but forced the Russian into a third set and tested her all the way. It was Laura Robson who shone the most though. She made the main draw of a Grand Slam for the first time without the help of a wildcard after coming through qualifying. She then won her first round match, leading her opponent before she retired, but succumbed to Anabel Medina Garrigues after making several unforced errors. The run will give her a great boost in both ranking points and morale as her year had been disappointing at one stage, having dropped out of the top 200. Other noteworthy results to report are Ernests Gulbis‘ straight sets win against Mikhail Youzhny, Bernard Tomic’s victory over Michael Yani and Grigor Dimitrov’s loss to Gael Monfils. Bojana Jovanovski and Rebecca Marino lost their opening matches in the women’s singles but Simona Halep defeated French Open champion Li Na in a shock result. All results for the men’s singles and women’s singles so far can be found via the US Open website. On the day former champion Ana Ivanovic crashed out of the French Open, new talent Bojana Jovanovski showed why Serbian tennis still has a bright future. The 19-year-old is the youngest player in the top 50 of the women’s game and in her first round match against Andrea Petkovic she showed why she’s there. She did lose 6-4, 7-6 (7-3) but had taken several breaks and even led *5-2 in the second set before eventually being rolled over by the 15th seed. Yet I found her match enthralling and I also think Jovanovski is my new favourite player on the WTA tour. Let me just point out, I had been subjected to Aravane Rezai’s dour show on Day 2 as well as the appallingly bad match between Patty Schynder and Sorana Cirstea beforehand so that might have played a part but I thought Jovanovski was great. Her forehand in particular produced some thunderous shots down the line which culminated in her 31 winners but 41 unforced errors along with Petkovic turning up a gear towards the end of the match ultimately lost it for her. My only qualm is she reminds me of Vicky Pollard (just the hairstyle and earrings). However I’m looking forward to watching her hopefully progress into a future household name. An even younger player did make the second round though. 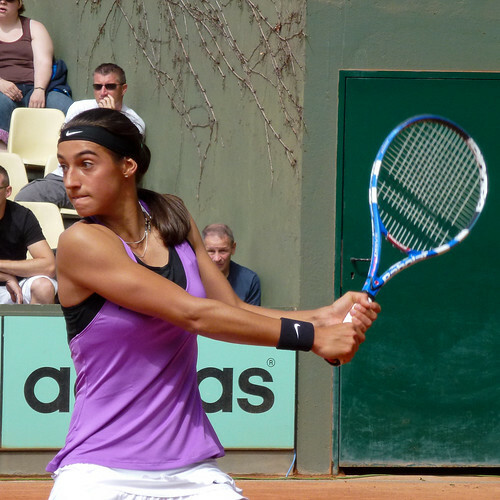 French wildcard Caroline Garcia beat experienced campaigner Zuzana Ondraskova to set up a meeting with Maria Sharapova. The 17-year-old had also reached the second round of the Australian Open this year and although further progress this week looks unlikely, she could improve France’s underachieving status in the sport with Mary Pierce and Amelie Mauresmo now just memories. Heather Watson could do the same for British tennis. She’s already become the first British woman to reach the second round at Roland Garros for 17 years. Elena Baltacha may be slightly miffed having won her match against Watson’s close friend Sloane Stephens. Fellow American prospects Christina McHale and Coco Vandeweghe also lost to Sara Errani and Maria Kirilenko respectively whilst Melanie Oudin couldn’t upset current title-holder Francesca Schiavone. In the mens’ singles there were also some good results for the emerging players. Kei Nishikori has reached the second round for the second consecutive year after beating Yen-Hsun Lu. He’ll have to defeat 31st seed Sergiy Stakhovsky if he’s to top his longest run at the French Open. Ryan Harrison got a place in the first round thanks to a lucky loser spot and almost took full advantage before fifth seed Robin Soderling finished him off. The 19-year-old looked fully out of his depth when his Swedish opponent destroyed him 6-1 in the first set before the American took the second on a tiebreak. Despite then breaking Soderling many times throughout the rest of the match he couldn’t keep his own service game together and lost a spirited display in four sets. Over the last few days I don’t think I’ve ever wrote as much Italian before in my life, so I’m taking a break from Milan’s Trofeo Bonfiglio and looking towards the slightly wider covered French Open in Paris. Qualifying has already finished and today the main draw was decided with help from current and former champion Rafael Nadal and Ana Ivanovic. My blog will cover the junior tournament most prominently but with that not scheduled to start until 30th May I will pay attention to the young players coming through who have been seen here previously and even some new faces. The thing about a Grand Slam is one good run and you’re in the top 10 or 20 in the world when before no one had heard of you unless they were the die-hard sitting-in-the-rain-for-10-hours-to-get-in-court-18 kind of fans. Petra Kvitova and Tsvetana Pironkova will testify to that. News, so far, is good for Heather Watson and Sloane Stephens, two players who have had a mention on Ace of Baseline before and whom I track frequently. American Stephens is a particular surprise after overcoming the top seed Anastasia Pivovarova in the last round of qualifying 6-3, 6-4. Watson didn’t drop a set in making the main draw and joins fellow British players Elena Baltacha and Anne Keothavong who qualified outright based on their ranking positions. In the men’s qualifying, Ryan Harrison lost to another youngster in Spaniard Javier Marti. The 19-year-old won the third round match 6-2, 7-5 and will face fellow countryman and qualifier Albert Ramos in the main draw. Elsewhere in the main draw match-ups, I may have to cut down my coverage of Milos Raonic as the Canadian looks like he’s made it. Seeded 26th, he’ll face Michael Berrer in the first round and could face Andy Murray in the last 16 should all go to plan. The next step is asserting a top 10 position. Other noteworthy matches are wildcard Bernard Tomic vs. Carlos Berlocq, Kei Nishikori vs. Lu Yen-Hsun and in the women’s draw the youngsters have it tough with Maria Kirilenko vs. Coco Vandeweghe, Andrea Petkovic vs. Bojana Jovanovski and Francesca Schiavone vs. Melanie Oudin. For the full qualifying results and more, check out the Roland Garros website where the main draws for the men’s singles and women’s singles are also available. 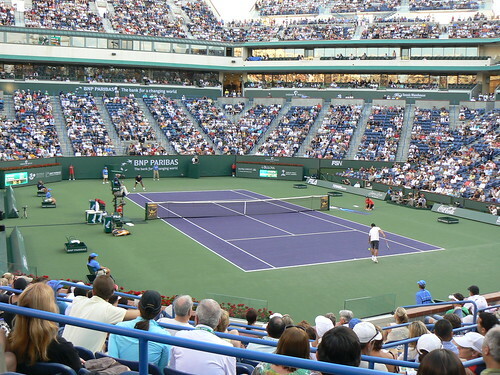 The quarter-final line-up for the BNP Paribas Open at Indian Wells has been decided and for some of the up and coming tennis stars it’s been a very productive tournament. Ryan Harrison impressed the most after reaching the fourth round as a wildcard entry. En route he beat top 50 Frenchman Jeremy Chardy and 22nd seed Guillermo Garcia-Lopez before Roger Federer dispatched of the American in straight sets. It was far from an easy ride for the 16-time Grand Slam winner though as Harrison took the first set to a tiebreak which the former world number one edged 7-4 before securing the second with a more comfortable 6-3 scoreline. In the previous round Harrison had met another young prodigy in Milos Raonic. The 20-year-old Canadian defeated home favourite Mardy Fish to reach the third round but lacked the same sharpness which earned him his first ATP Tour title last month. However, 17 aces as well as some great baseline work from Raonic showed the class he possesses and he’s now flown out to Miami in preparation for the Sony Ericsson Open. Ernests Gulbis had looked in good form going into his third round tie with Serbian Novak Djokovic after beating Taiwan no.1 Yen-Hsun Lu but this year’s Australian Open winner kept his 2011 unbeaten streak intact with a 6-0, 6-1 blitz. Elsewhere Aussie Bernard Tomic reached the second round whilst further American success came from Ryan Sweeting, Donald Young and Sloane Stephens from the women’s draw. Kim Clijsters has already declared she’s a fan of 17-year-old Stephens who lost to world number one Caroline Wozniacki in the second round. Certainly the experience gained as well as the ranking points earned from the combined ATP Masters 1000 and WTA Premier event will aid all the successful young players with Harrison already carving a name for himself.